Conversation is defined as exchange of words, ideas, thoughts and information between two or more people. Conversation is the fundamental method of getting to know another person, sharing your knowledge, and in general, talking to another person. Seems like an easy concept, right? Unfortunately, not everyone is a gifted conversationalist. A good conversationalist is a person who can easily carry out a conversation, be it small talk, or important conversations with people. A lot of people struggle to even make small talk with people. This might stem from various causes, such as not being confident enough of yourself, having low self-esteem, not having enough knowledge about the topic in conversation, etc. whatever your reasons are, being a good conversationalist is an acquired skill which everyone must possess in today’s world. Being a good conversationalist is a skill required in almost every phase of our lives- be it in business, in social settings, in dating, at work, or even in your personal lives. The basic rule of psychology states that all people crave to feel acknowledged and appreciated. When you are trying to strike up a conversation with someone, show a genuine interest in them. You want to know who that person is, what he/she does, what are their likes, and dislikes. The basic principle for building up a good conversation is finding a topic which interests both parties, in order to keep the conversation going. Do not try and show fake interest in the other person, as sooner or later, your disinterest will show through. Find someone you genuinely are interested to talk to, and strike up a conversation with them. If you don’t know how exactly to start, start by introducing yourself, and telling them something about yourself. If the other person is interested, they will respond back to this appropriately. Imagine someone asks you to tell them something interesting about yourself, like what your hobbies are. Now, as you delve passionately into the topic of how much you love listening to jazz and dancing, the other person starts fiddling with their fingers, looking at their feet, scratching their heads. You will immediately feel insulted, as the person is not showing any interest in what you are saying, and you will feel like they just can’t wait to leave the conversation. Now imagine you are doing the same things to a person, not because you are disinterested, but because maybe you are too nervous to look them straight in the eye. Whatever your reasons might be to do so, it will certainly not be taken lightly by the other party. You just have to maintain eye contact with the person you are in conversation with. Nod your head sometimes, as if you are agreeing with what they are saying. Not maintaining eye contact is an instant conversation killer. Keeping this is mind, you also don’t want to stare at the person while they are talking and make them feel uneasy. Try and maintain a balance, as you don’t want to scare your conversation partner away! Most people feel flattered when you want to know more about them. When you are trying to start off a conversation, ask questions about the other person. If you are meeting someone for the first time, start off by asking non-threatening, and non-invasive questions about them. While you want to get to know the other person, you also don’t want to give the impression of being too pokey, or interfering in their lives. If you know someone moderately well, you will already know about some of their interests or likes and dislikes. This will make it easier for you to ask more appropriate questions. As you get to know them better, you can ask questions like “What is your biggest ambition in life?” or “what is your dream job” etc. Ask them engaging questions which will make them talk more about themselves, giving you a chance to get to know them, as well as letting you answer their counter questions. Good conversationalists are good listeners. Having good listening skills is essential in order to carry on a good conversation. When they pause, ask them questions like “really, so what did u do next?” in order to show your interest in what they are saying. The biggest turn off in a conversation is when a person continuously talks about themselves, and does not show any intention of getting to know the other person. So be a good listener, and you will become a better conversationalist. Always focus on the positive topics. Rather than focusing on the past grievances, or topics that provoke negative emotions, focus on topics which are more positive, such as future goals, topics which invoke happy memories or happy emotions. While it is alright to talk about topics which are on the darker side once in a while, try and deviate to the positive topics. This will also create a positive impact of you on the other person. They will want to continue conversation with you, since you are able to make them feel positive. Conversation topics may vary from politics, to music, to news issues, to debates, sports and fashion. In order to be a good conversationalist, you have to know how to keep yourself part of the conversation. If you do not know about the topic in discussion, you won’t be able to give your opinions on the topic in question. In order to strengthen this skill, you must keep abreast of key issues and current ‘hot topics. When discussing these topics, keep in mind, not everyone’s opinion will match yours. In these situations, you must never argue, lose temper, or be uncensored. You have to accept the other person’s viewpoint, even if it differs from your own. It is alright to have a viewpoint different from that of the other person. You can voice your opinion, and have an open, healthy debate. But in doing so, remember to never hurt or offend the other person. This will just score you negative points on the conversation score board. Every person loves to hear good things about themselves. Give your conversation partner compliments occasionally. But do this with caution, as you don’t want your compliments to be misunderstood. Be clear with what you are saying, and be precise. Do not be too vague when giving compliments, as there are greater chances of misunderstanding the person this way. The best conversations take place on a 50-50 sharing basis. If you are only interested in talking about yourself, the other person will think of you as self-absorbed and narcissistic. On the other hand, if you only talk about the other person, you will not get a chance to voice your own opinions, and it will feel more like an interview than a conversation. Learn to strike that balance between talking and asking, and you will become a master conversationalist in no time! If you are trying to have a conversation with a robot, or a computer, your conversation might be pretty mild. But if you are in conversation with another human being, chances are he/she might say something judgemental, critical, or even make a bad joke once in a while. You cannot expect the other person to always check themselves when in conversation, so the best thing in these cases would be to just ignore, laugh or shrug it off. Do not start a debate or argument over what the other person said. If they said something vague which you might infer as offensive, give them the benefit of the doubt, unless proven otherwise. As they say, “There is a time and place for everything”. Be ready for a conversation in a serious environment, but at the same time, also be prepared for light hearted conversations. Be yourself, and be humorous when required. You can offer a joke you heard, or even tell them one on spot! Be bold, and show off your wit. Judge your audiences reaction to see if you are hitting the right notes or not. Just make sure your humour is not considered inappropriate or offensive by anyone, as that would lead to further heated debates. People who are shy, or nervous to make conversation, often end up mumbling or eating up their words. Try and avoid this as much as possible. Speak loudly and clearly. You want to make sure all your words are heard properly. On the other hand, you do not want to be louder than you are supposed to be. This can cause a lot of discomfort for the other party, as they might not want their private conversations to be heard by the general public around them. Once again, find the balance, and stick to what works for you. One of the most annoying conversationalists you will find, are those who are easily distracted by words, thoughts, memories, or anything else in general. These people will change the topic without even finishing off the conversation. they tend to jump topics, and have too much to say in too little time. This will lead to frustration, as you cannot clearly concentrate on any one topic of conversation, and you will eventually bore your conversation partner. Try and stick to the topic as far as it goes, and know when it is appropriate to change the conversation topic. This will lead to more favourable reaction towards you. When you are talking about someone’s private life, or something which provokes emotion in the other person, make sure you are empathetic towards them and what they are saying. This will cause them to trust you, and also carry on the conversation. Give and take is part of a good conversation. When you are talking to the other person, always take a feedback from them regarding what you are saying. Ask them questions like, “So what do you think?” and “What would you advice here?” etc. Also, give adequate feedback to the other person. You want to show your involvement in the conversation as much as they are showing. A golden rule of making good conversation is, never interrupt the person when they are saying something. You might have something important that you remembered, or you might want to voice your opinion, but always wait till the other person is done talking. Wait for your turn, as the other persons flow or chain of thought might be broken by your interruption. 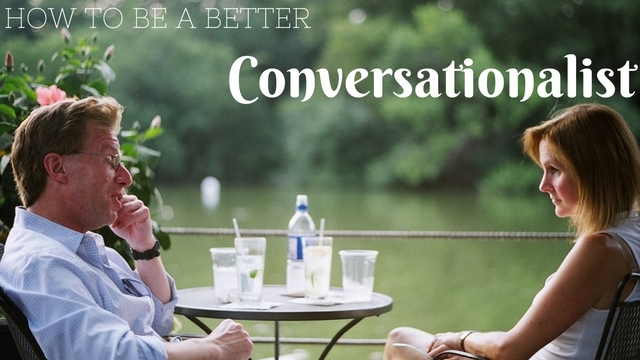 Finally, the most common advice to be a better conversationalist is to remember to be yourself! Talk about things which interest you, show an active interest in the other person, and don’t be shy of putting yourself out there in front of others.